This will be our final post regarding this event. 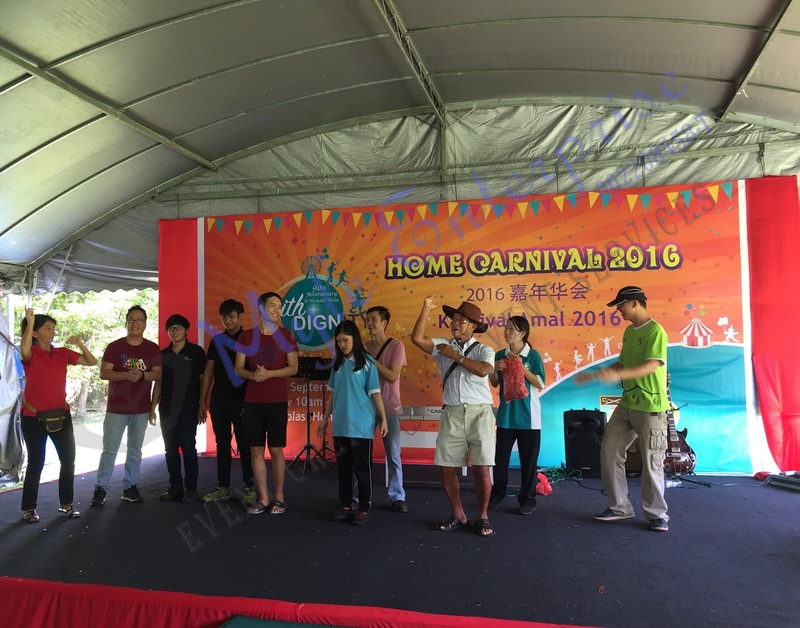 We have recently been a part of St. Nicholas’ Home, Penang‘s yearly carnival as we have uploaded our previous blog posts on this event – firstly a blog with a video to promote this event and an article regarding the event. Our third and final blog post is a video on the event itself, as seen here. If you like this video or the previous posts about the event and you would like one for yourself or your company, please do not hesitate to contact us. We have our blog packages for you to choose from with different ways of featuring you, your company or events and attractive rates for different types of blog packages. On 24 September 2016, St. Nicholas’ Home, Penang held their yearly carnival at their venue at Jalan Bagan Jermal in Penang. It is called the St. Nicholas Home Carnival. It was from 10a.m. to 3p.m. The carnival had booths where people were selling food, products and items There were also game stalls set up where many people were seen having fun at those stalls. St. Nicholas’ Home, Penang’s very own blind masseurs also set up their own booth area to offer massages to visitors of this carnival. There were tables set up near the booths which allowed visitors to sit down and enjoy their delicious food bought from the food stalls. There was a stage where the official opening ceremony of this carnival took place and also some performances. Chairs were set up in front of the stage for visitors to have a seat and view the stage programmes. The event began with speeches by VIPs. 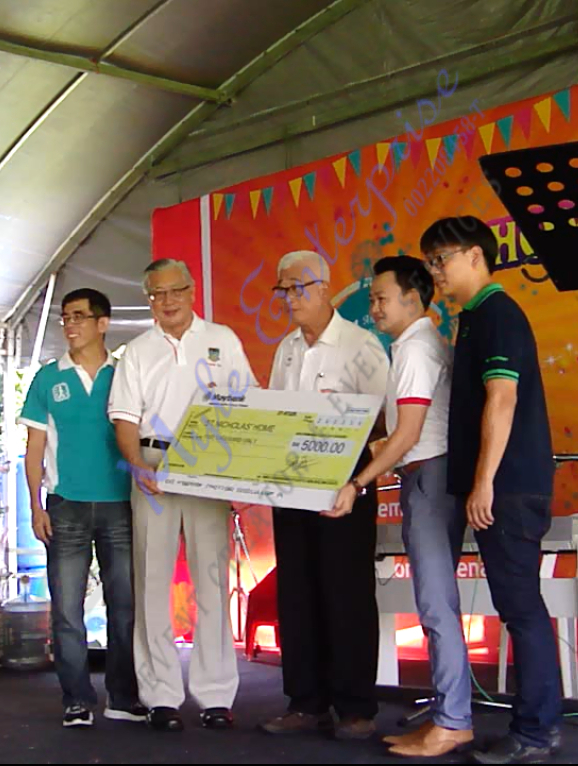 After that there was a presentation of cheque from a company donating to St. Nicholas’ Home Penang for another one of their upcoming event. This was followed by the official launching ceremony of this carnival. The VIPs and Members of the Board of Directors of the organisation getting ready to launch the carnival. The visitors counted down together with those on stage to launch this carnival. The poppers were popped to signify the launching of this event. Colourful confetties flew in the air upon the launching of this carnival. The visitors were enjoying themselves during the launching and also the entertainment lined up throughout this event. The visitors and performers were enjoying the programmes of this event. There were singing performances, dance performances, magic show and emcee to entertain the visitors of this carnival. We emceed for them during this event. St. Nicholas’ Home, Penang’s band which consists of Robert on the guitar and Samantha on the keyboard were entertaining the crowd on and off at this event. They are visually impaired but they can play their musical instruments beautifully and they can sing as well. Their charity organisation also has a Recycle Contemporary Band which was supposed to perform at this carnival but they could not make it. The band uses recycled items like water bottles and cooking utensils to make music. Their band is also called “Ayam Taugeh”, which means “Chicken Bean Sprout” in English and if you are interested to enquire about any of their bands, you may contact St. Nicholas’ Home, Penang at 04-229 0800.At the later stage of the event, there was a surprise programme of prize giveaway conducted by us. We gave away our company’s voucher worth RM50 which can be used for event services. A question related to the carnival was asked and the first person on stage to answer the question correctly won the prize. A lady went on stage and answered correctly, so she won the prize. 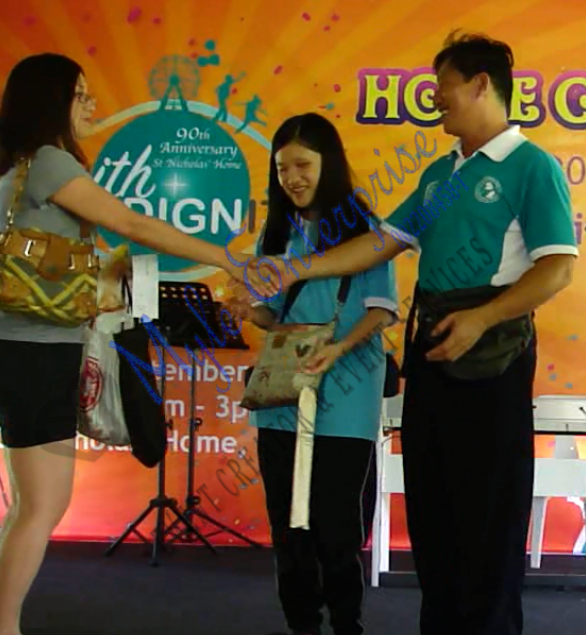 This lady won the prize and the voucher was given out by Robert and Samantha of the St. Nicholas’ Home, Penang’s band. After that, we were nearing the end of the carnival and music was played through the sound system. 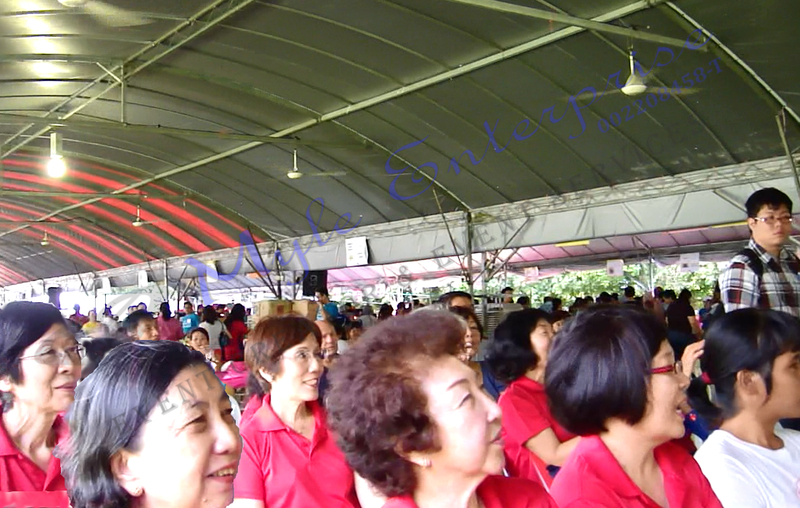 One of the visitors, an elderly gentleman went on stage and danced. He seemed to be enjoying himself at the carnival, which was good, and so, we invited more people on stage to dance together with him. 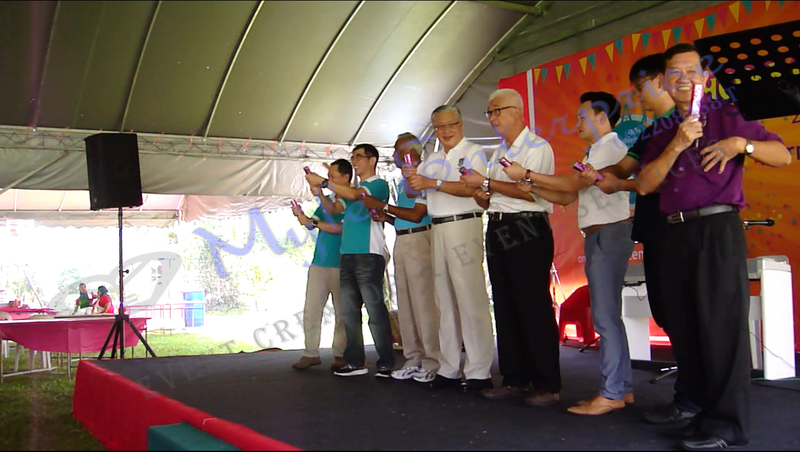 Towards the end of the carnival, a visitor, the volunteers, the sound and technical team, the St. Nicholas’ Home, Penang band and some members of their organisation went on stage to dance. It was a good time at the carnival with so many things to see, try, eat, play and buy at the stalls; and so many event programmes to enjoy. Most of the stalls were sold out by the end of the event, which was good news for those who came to set up a stall.This year happens to be St. Nicholas’ Home, Penang’s 90th Anniversary. Their theme is Faith + Dignity. Congratulations, St. Nicholas’ Home, Penang on the success of your carnival this year and wishing you a Happy 90th Anniversary. St. Nicholas’ Home in Penang will be holding their annual carnival on 24 September 2016 (Saturday), from 10a.m. to 3a.m. They are a charity organisation supporting the cause of creating awareness for the visually impaired and helping the blind. Here is a short video on their team saying a few words about their event. We are emceeing at this carnival. Come and support their event.